Each time I arrive in the USA I try to mentally unplug my Australian English dictionary, and insert the USA English cartridge. Whilst I’m sure my American friends find my accent charming (well, the woman who cut my hair, and the checkout chick at Safeway certainly said they “luurve my accent”) on occasion I just plain confuse the locals. I continue to refuse to spell words using ‘Z’, or drop my ‘U’s when writing, even when producing work-related documents where the primary audience is American. Need a little subversion here and there. And that’s despite me working with HTML code a lot, which is firmly USA – ‘centre’ is ‘center’ and so forth. Which reminds me, I was standing outside an office building one day in San Francisco, named the ‘something something centre’. I pointed out, tongue in cheek, to my American friend how pleasant it was to see the word spelt right – to which he replied the owners probably wanted to make the building sound ‘fancy’! So there you are, ‘centre’ is fancy, ‘center’ is not. 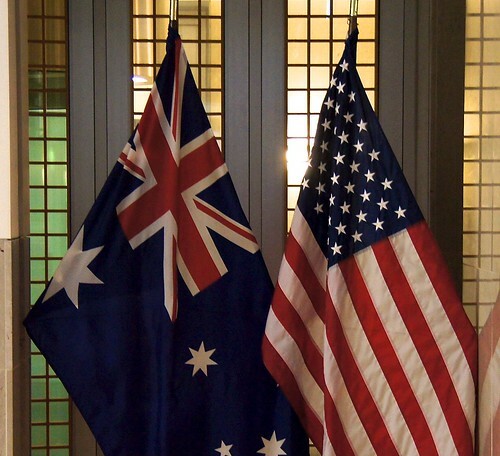 There are many websites offering Australian <-> American translations or word equivalents. Here are the ones that confuse my US friends if I forget the mental dictionary change. Americans plug things into power strips. Australians plug things into power boards. Americans buy Advil at the drug store. Australians buy Panadol from the pharmacy. Americans eat their entrees after their starters. Australians eat their entrees before their mains. Americans cook with cilantro. Australians cook with coriander. American babies poop in diapers. Australian babies poo in nappies. Americans wear their thongs on/in their bum. Australians wear their thongs on their feet. Americans use the restroom. Australians use the toilet. Americans lounge around in tracksuit pants. Australians lounge around in trakky dacks. Americans buy gas. Australians buy petrol. Americans drive pickups. Australians drive utes.